Editorial: Five Years of Excellence! It is my pleasure to announce Journal’s audience that this issue marks the fifth year anniversary of the Journal of Cognitive and Behavioral Psychotherapies. The Journal of Cognitive and Behavioral Psychotherapies is the direct descendent of the Romanian Journal of Cognitive and Behavioral Psychotherapies. The Romanian Journal of Cognitive and Behavioral Psychotherapies was founded in 2001, as the official publication of the Romanian Association of Cognitive and Behavioral Psychotherapies. 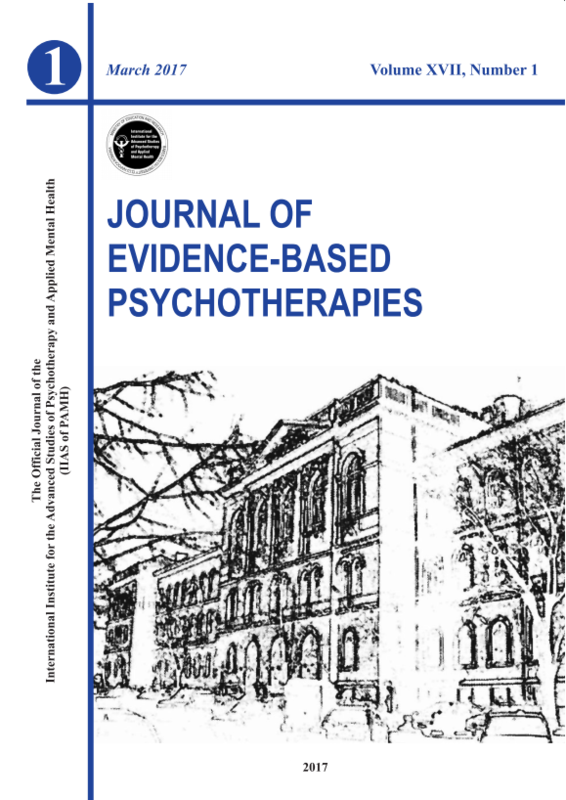 Because of the high standards promoted by the editorial board, the Romanian Journal of Cognitive and Behavioral Psychotherapies has quickly become influential in promoting cognitive and behavioral psychotherapies in Eastern and Central Europe, and was abstracted in the PsycInfo (beginning with 2004). Taking into account the brief period of the journal’s activity (2001-2004) all these accomplishments are notable. Dwelling on these results and taking into account the suggestions of many professionals in the clinical field, we have pushed our contribution in cognitive and behavioral psychotherapies a step further. Thus, in 2004, the Babes-Bolyai University (http://www.ubbcluj.ro), Cluj-Napoca, Romania and the Romanian Association of Cognitive and Behavioral Psychotherapies founded the International Institute for Advanced Studies in Psychotherapy and Applied Mental Health (International Institute) (http://www.psychotherapy.ro) to promote advanced study and scholarship in psychotherapy and applied mental health by postdoctoral training and research. The Institute offers training in psychotherapies and other mental health applications/interventions culminating in a postdoctoral degree – Doctor of Science (ScD or DSc) – for those who have already been awarded a doctoral degree in their field, relevant to psychotherapy and applied mental health interventions. Through the International Institute we aim to promote our contribution to cognitive and behavioral psychotherapies outside Romania, at the international level, with a special focus on Eastern and Central Europe. To better reflect its international impact and aims, the name of the Romanian Journal of Cognitive and Behavioral Psychotherapies was changed into the Journal of Cognitive and Behavioral Psychotherapies. The editorial board of the Journal has been expanded by including newly distinguished professionals, once more reflecting the journal’s international and regional aims; moreover, in order to promote a scientist-practitioner perspective, the journal’ s editorial board is a unique combination – not typical but desirable in the clinical field – of clinicians and researchers, all dedicated to an evidence-based psychology and psychotherapy. Also, starting 2004 (September, issue), the journal is published by the A.S.C.R. Press, the press of the Society of Cognitive Science, one of the largest and most prestigious publishers of cognitive science journals and books in the Eastern Europe. Thus, the Journal of Cognitive and Behavioral Psychotherapies is the official publication of the International Institute. To our knowledge, there are no other journals specifically dedicated to cognitive and behavioral psychotherapies in Eastern and Central Europe. As we have faced all these exciting changes, it has been my privilege and honor to continue and transfer my editorship from the former Romanian Journal of Cognitive Psychotherapy to its changed format, that of the Journal of Cognitive and Behavioral Psychotherapies. Today, after five years of committed and rigorous work, our editorial team is proud of the Journal’s excellence. It is indexed full text in EBSCO and ProQuest and it is abstracted in IBSS and PsycInfo, being the reference standard for research and practice in evidence-based clinical practice in Eastern and Central Europe, with a good impact worldwide. In sum, the journals’ mission and format are indicative of the International Institute’s vision for the future of cognitive and behavioral psychotherapies. The publication of the Journal of Cognitive and Behavioral Psychotherapies reflects both the editorial board’s and publisher’s belief that it fills a gap in the scientific literature available on this topic. The editorial team is enthusiastically committed to join in full partnership with others who seek to understand the nature of cognitive behavioral psychotherapies. Finally, I want to thank the distinguished group of academics and practitioners who agreed to serve during my tenure. They are the journal’s definitive source of continuity and integrity.